Looking for some fun through photo editing tools? Try Photomica website and there are 100s of such tools with which you can create your own edited and funny pictures. Right now you are on page of Image funny face - photo face funny - King of Spain Effect. You can become the king by just uploading your or your friends photo online by the uploader. 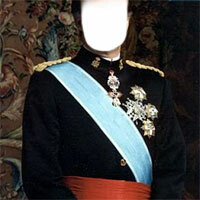 Just adjust the face in the photo you have uploaded in the face in hole present on the page and get dressed like the King of Spain. This is funny as well as easy.